Is walking fewer than 900 steps per day associated with functional decline in older hospitalized patients? A research letter published online in December 2016 by JAMA Internal Medicine suggests it is. A release from the publisher notes that recent research has suggested 900 steps per day were normative for frail older adults and for older adults hospitalized in internal medicine units. Maayan Agmon, Ph.D., and Anna Zisberg, Ph.D., of the University of Haifa, Israel, and coauthors examined whether that amount of steps differentiated those patients who do, or don’t, experience hospitalization-associated functional decline. The authors used patients within an ongoing study of a newly designed program that promotes in-hospital mobility. The study included 177 older patients hospitalized in internal medicine units at an academic medical center in Israel during the last three months of 2015. Total steps per day were calculated and the evaluation included cognitive, functional and mobility assessments. Walking fewer than 900 steps per day was associated with hospitalization-associated functional decline, according to the results. Among the 41.8 percent of patients who walked less than 900 steps per day, 55.4 percent (57 patients) reported hospitalization-associated functional decline. 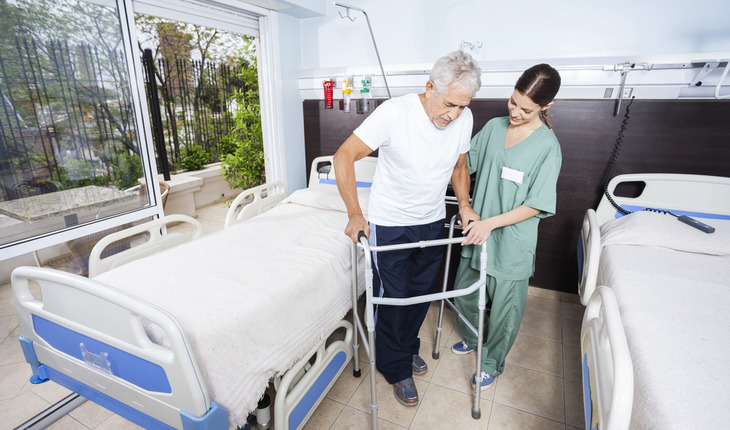 Among the 58.2 percent of patients who walked 900 steps per day or more, only 18.4 percent (14 patients) experienced hospitalization-associated functional decline. Limitations of the study include its sample of a relatively high-functioning group of older adults from a single site. “Nonetheless, this study adjusts for a broad range of intervening variables and relies on gold-standard, sensor-based data collection. Thus, it fills the gaps uncovered by previous studies and provides preliminary evidence to support the recommendation of 900 steps per day for HAFD [hospitalization-associated functional decline] prevention. These findings should be confirmed by future studies involving diverse groups of older adults,” the study concludes.